Going viral is the holy grail for many marketers looking to extend the reach of their advertising and better engage with the consumer. But how do you make something powerful enough it encourages someone to share it? According to University of Melbourne’s Dr Brent Coker, author of the book, Going Viral, and a leading expert on word of mouth, the key thing about sharing is that it’s linked to emotional response and our very human, primitive desire towards social behaviour. 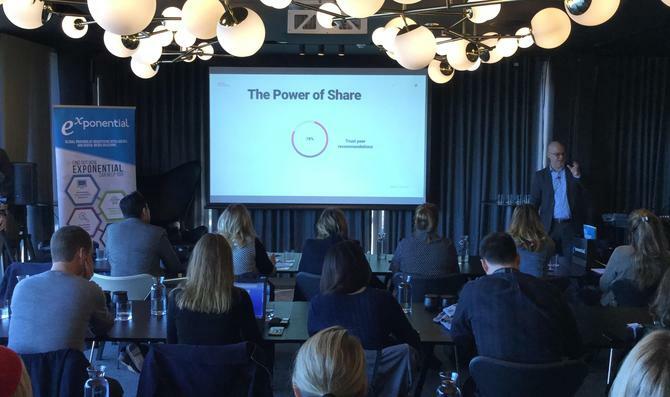 “Emotion increases arousal, and it’s arousal that causes sharing,” he told attendees at the recent Exponential Brand Summit. Arousal is a hardwired activation in the brain that sits on a continuum from ‘coma’ through to ‘manic’. “To try and get people further on that scale to high arousal is key to sharing,” he said. Based on insights into the psychology of the brain, Dr Coker outlined five emotional triggers marketers can employ not only to better appeal to consumers, but actively encourage them to share their brand advertising. One way to generate emotional response is through facial expressions, Dr Coker said. “Facial expressions are contagious...if you walk into a room and everyone’s happy, it makes you feel happy. People recognise the same facial expressions and that transcend across different cultures,” he said. As an example, Dr Coker highlighted a study he’d undertaken of three groups to see which was more likely to share content about a movie. Situated in a public library, the groups were exposed to fake ghosts, followed by people dressed up as ghostbusters. Group A watched the footage from a distance and couldn’t see any facial expressions, while group B were shown the faces of people who were angry. Group C were shown people laughing. The study then looked at their likelihood of sharing. Nine per cent of group A said they’d share the movie, a figure that increased to 15 per cent across group B, who had been exposed to negative facial expressions. This leaped to 31 per cent across group C, which had seen positive facial expressions. “Facial expressions are therefore one way to transmit the emotion from your content,” Dr Coker said. Of course, not all emotions work in the same way. Another effective way is by creating intrigue. The trick is how to ground this to a brand element or reference point successfully, to help motivate to take the challenge. “One way is by including the brand as a hero in the story, rather than an add-on or bolt on,” he said, highlighting brands such as Nike and GoPro as great examples of this. Another is through puzzles. The Rubik’s cube and associated marketing is another a clever illustration of this intrigue, Dr Coker said, which tapped into the realm of possibility. Not only was the packaging clear so people could see the puzzle, it stated the high level of combinations with the low number of twists required to actually solve the cube, encouraging people to work it out. Another focus of the marketing was to recruit kids solving the puzzle in under 10 seconds as a core part of the core part of the marketing. “That raised the question: If you’re an adult, why can’t you do,” Dr Coker said. A second social media example of intrigue Dr Coker pointed was from an ad agency in France, which set up an actress as a new person on Instagram. Every photo showed her seemingly having an ideal life, complete with lavish scenery, parties, onsite locations and social setting. To create reach, the agency used bots to follow key opinion leaders, and employed carefully curated hashtags. But it was when they revealed the ad’s motivation, which was to address alcoholism, and pointed out that every photo showed the actress holding a drink, that followers went from 16,000 to 100,000 in a couple of weeks, and the press jumped onboard. A third emotionally inspiring component is care, and that’s something data is helping brands achieve that. The challenge is that it’s not always obvious what people care about. One example Dr Coker highlighted from The Ritz-Carlton hotel group was about supporting family. For business travellers, the thing they care about the most could be time. Other social groups care about the environment. A fourth way of fostering an emotional response that encourages sharing is via memories. The challenge here is identifying memories common to lots of people, Dr Coker said. One way of driving memory is through music, and Dr Coker noted studies showed the slower the tempo, the longer people stay in-store. Another is smell. Dr Coker said Abercrombie and Finch uses smells in its stores reminiscent of being in a night club, for example. “But not all smell aggravates arousal, so it matters what smell you use,” he added.